Say goodbye to your personal space: JetBlue is about to cram 15 more seats into its Airbus A320. What’s more, after being one of the only remaining major airline holdouts, it’s also finally caving in and tacking on baggage fees. Yay. JetBlue said it would start offering new basic fares that don’t include a complimentary checked bag, as part of three new fare classes the airline is introducing next year. Along with Southwest Airlines Co. , JetBlue had been one of the last two U.S. airlines to offer all fliers at least one free checked bag—despite widespread adoption of bag fees by their peers in recent years. The move comes in response to airlines‘ ever-increasing financial pressures. 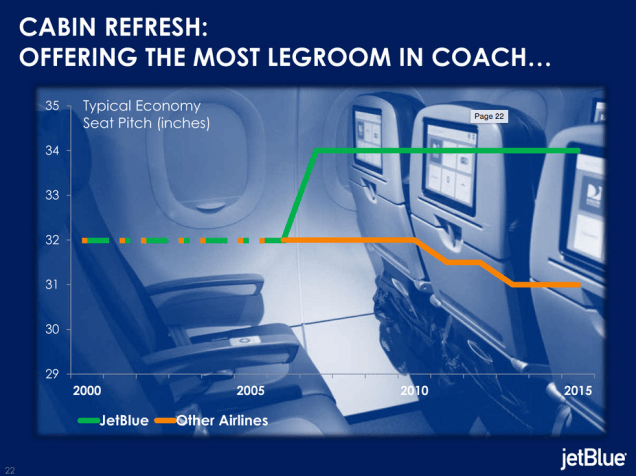 But to JetBlue’s credit, it will purportedly still offer more legroom in coach than any other major airline—at least according to its own calculations. So even though we’ll be going from an already cramped 150 seats to a preposterous 165, it’ll still have a half-inch over the closest competition. Even if JetBlue’s seat pitch did lose a solid 1.5 inches in total. And as your legroom is getting tossed out the window, so is your free checked bag. Though we still have yet to see how much it’ll actually be charging, we do know that it’s at least more than Southwest, the only remaining airline that doesn’t force you to pay for your changes of socks.